Welcome to the tropical oasis in central Nha Trang bay. For a business trip or family holiday, discover contemporary rooms filled with branded amenities and fabulous seaview balcony, alongside finest facilities and services. It's a lot better at Novotel! Situated along the main street of Nha Trang's famous beach, Novotel Nha Trang is located near some of the city's most fascinating attractions, including Po Nagar Tower, Long Son Pagoda, Vinpearl Amusement Park, etc. Perfect for leisure breaks and family holidays, activities include water sports, scuba diving, golf, island hopping and bargain hunting at the local markets. 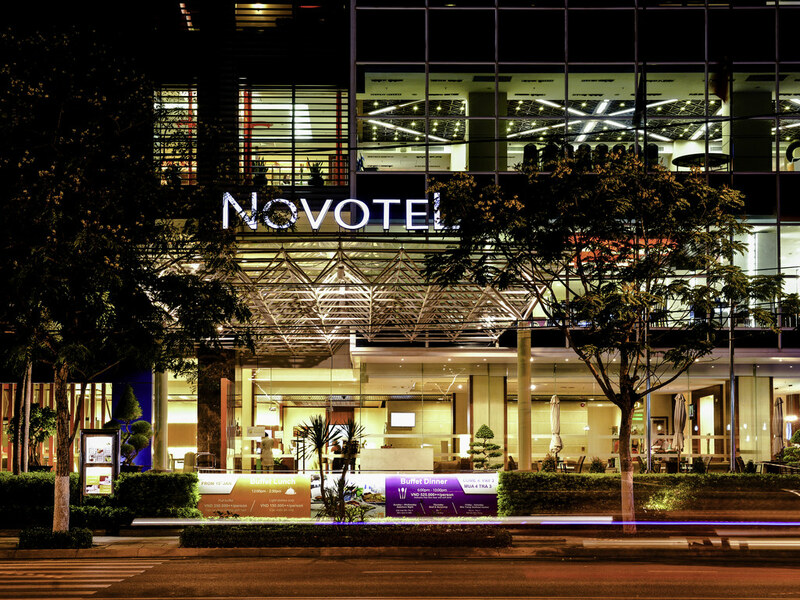 Novotel sits on the city's main road, which curves around the gorgeous coast. The hotel's central location allows easy access to nearby points of interest like museums, pagodas and amusement parks, as well as activities such as scuba diving and golf. Novotel Nha Trang offers seven kinds of rooms: Standard, Superior, Superior Ocean, Deluxe, Executive, Junior Suite and Suite. All include balcony and sea views. Settle down on one of our spacious couches at Le Bar, located on the ground floor. Enjoy rich afternoon coffee or swing by at night for a balanced cocktail. The daily HAPPY HOUR offers 50% off on selected drinks, valid between 05:00 PM and 08:00 PM. Lather on some suntan lotion and kick up your legs at the Pool Bar with daily buy 1 get 1 free drinks during happy hour (midday to 2:30PM). Located on the 3rd floor by the In Balance Spa and the fitness center. We had a lovely time, the hotel is well managed, the food and service is of a very high standard and the location is excellent. It all started from the friendly check in and with the great location we all had a great time in Nha Trang. All the staff are so friendly especially An at the front deck and Minh in concierge. Room was brilliant, Service was great and our entire holiday was just magic. We would like to say how brilliant young Anna was. She was so lovely and pleasing. You should be so happy that you have her working for you. When check-in, the receptionist arranged our room in a higher floor. Variety of breakfast is good enough for us to stay 2days. Sometimes hotel stuff walked with us to cross the street to beach, which I felt safer. Just steps away from the beach, friendly staff. Currency exchange is located on site. My family(6 adults and 3 children) began our one week Nha Trang trip at Novotel Hotel, but my baby boy got a deep cut on his left foot in the hotel swimming pool the first day we checked in . Though the hotel sent he to a hospital and payed for the medical treatment, but it did ruined our trip. I had to hug the little boy everywhere we went to, we canceled most of our activity outside and no more playing in water. Any way, thanks for Anna's kindly help. Wish Novotel Hotel can check the swing pool carefully and don't let this kind of issue happen again. We stayed for five days in late March the Hotel is perfectly located across the road from the beach and close to markets. This hotel really went out of their way to make us welcome as Accor members Mr Thi and Annna at the check in are just amazing and couldn’t do enough to make our stay enjoyable. Rims are spacious and cleen. Man at breakfast gave us the best service we have ever had at an Accor hotel along with Thanh they couldn’t do enough for us and breakfast food was good. Friendly staff, beautiful room and view, great location....also great bar!!! Stayed in March with my wife and son 7 years. Only positive impressions of the hotel. - professional and friendly staff (individual hello to Sonia!) - delicious breakfasts, no crowds and we always found a place to seat. - its own beach, albeit small and we did not always get a place under an umbrella, but we always found free sunbeds. - the room was on the 8th floor with a side view of the sea - beautiful and quite enough( did not pay extra money for a direct sea view) - cleaning the room every day - everything is clean and no complaints - a swimming pool - yes, a small one and there is never a sun in it ... there is no sense in it, but for a *hotel stars* it should be and nothing can change here - Once we took lunch at the hotel - for two and a child in ~ 240 dong, but drinks are not included, so 500 dong came out with wine and juices ... Lunch is good and tasty. - Once did the baby massage - he really liked. I liked the hotel, I strongly recommend it. Great bday arrangement! Superb view and nice room However, the water is not hot enough for bathing.